Kuiu Island in part of the SE Alaska's Alexander Archipelago. It's actually the 15th largest island in the US, yet only has a population of 10 people. 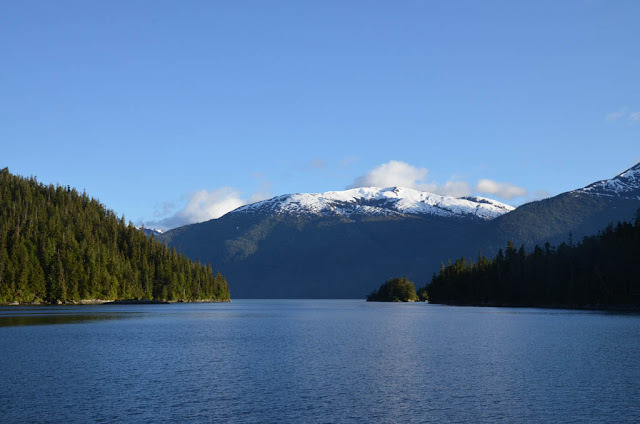 All of the island is in the Tongass National Forest, and parts are also within Tebenkof Bay Wilderness area, and the Kuiu Wilderness Area. 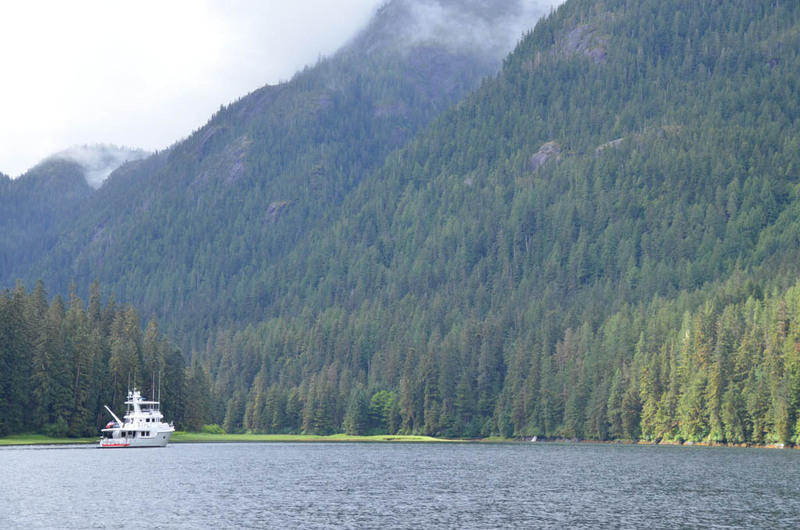 We spent a good chunk of our time in Alaska this summer circumnavigating and exploring Kuiu Island, and the neighboring areas. Once in Misty Fiord, we anchored for a couple of days and were treated to a visit by a young bear. 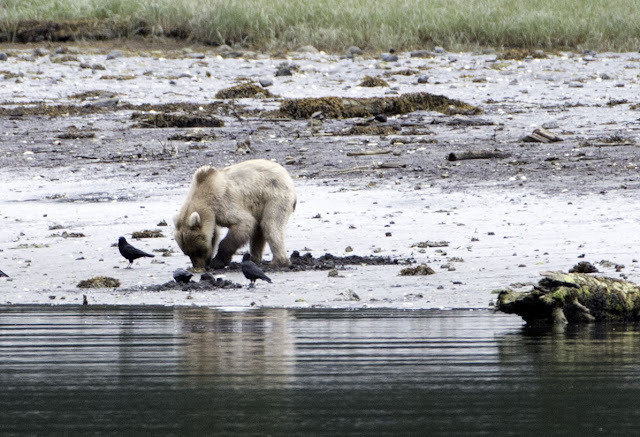 Here he is digging for some chow with crows hoping to get some left overs. Some other people started to approach in a dinghy, and this got the bear's attention. They are pretty funny looking when they stand up. Here's a another example of a water fall up close. The colors are just amazing. 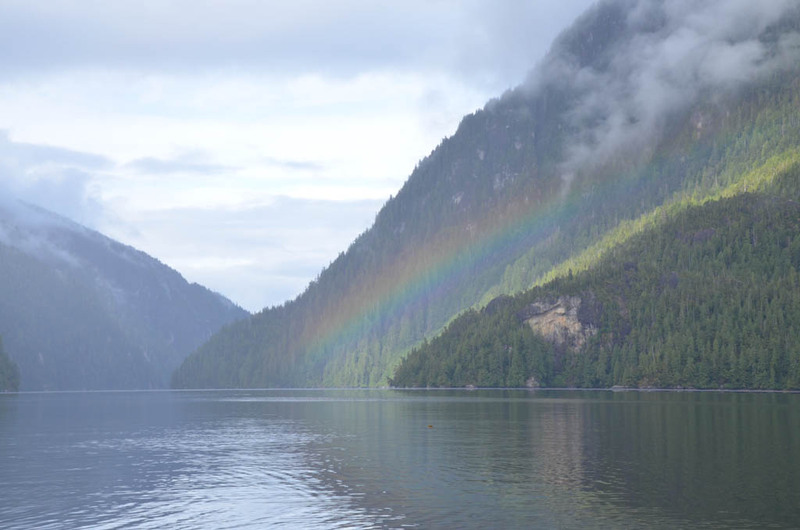 Here's Misty Fior living up to its name, rainbow and all. One stop was Coronation Island off the southern tip of Kuiu. We were in a protected bay, but it was very windy and it was just coming from everywhere. I have never experience such confused wind. Here's out anchor trace for the 12 hrs or so that we were there. 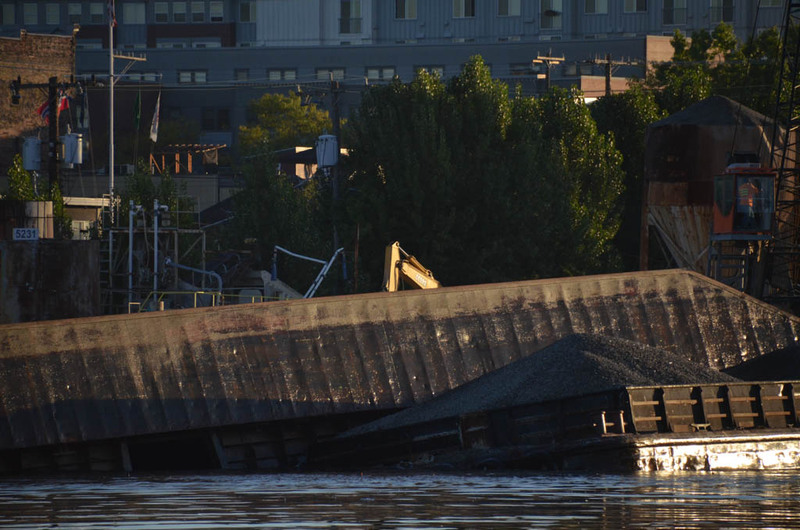 You can see the boat was all over the place. 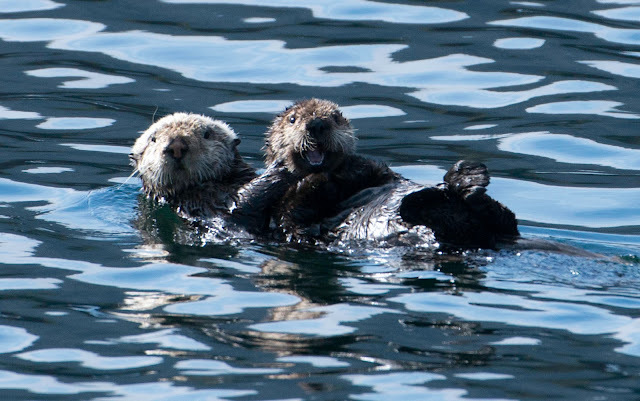 And here is a mom with her baby checking us out. 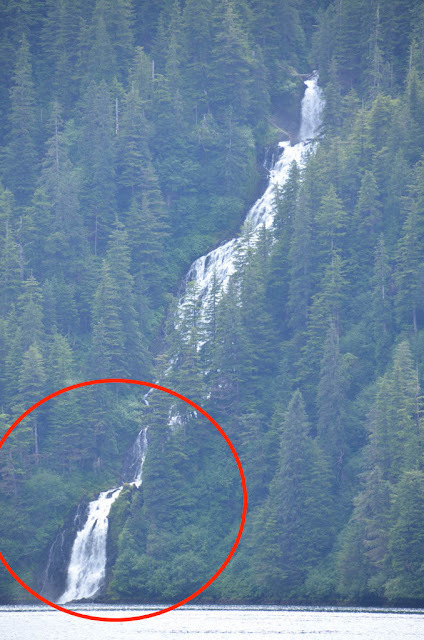 OK, this waterfall in Red Bluff Bay is really big, and hopefully this sequence of pictures will show it. 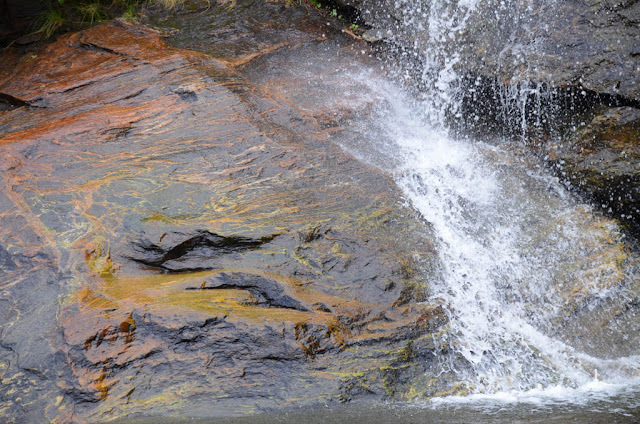 Below is the full water fall. The part circled in red is the next picture. 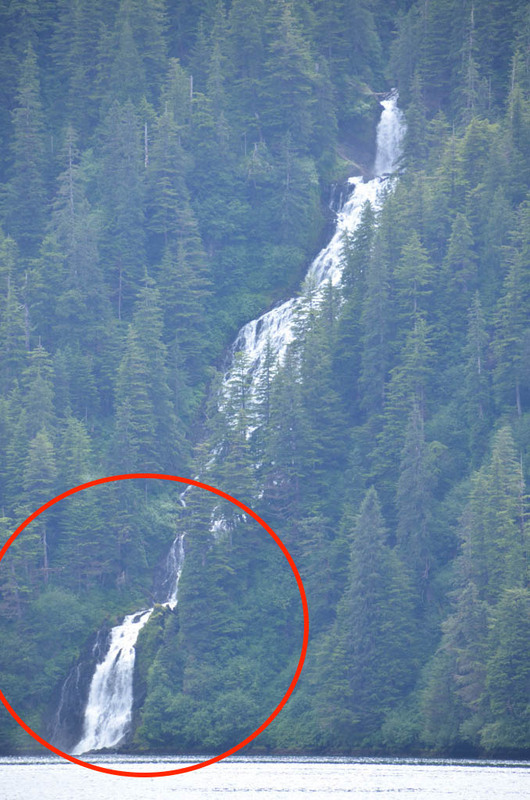 Here we are zoomed in a bunch, but wait. 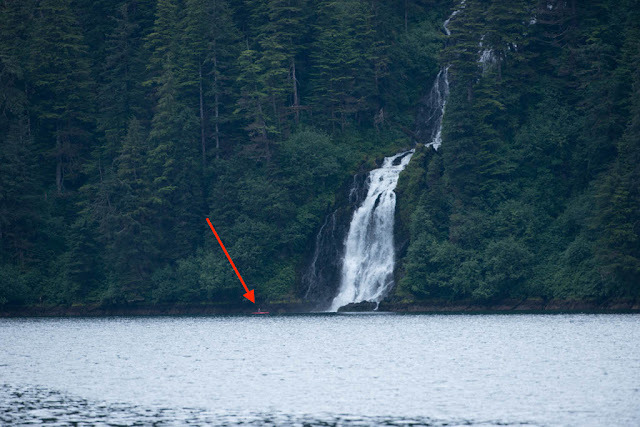 The red arrow is pointing to a red Kayak. 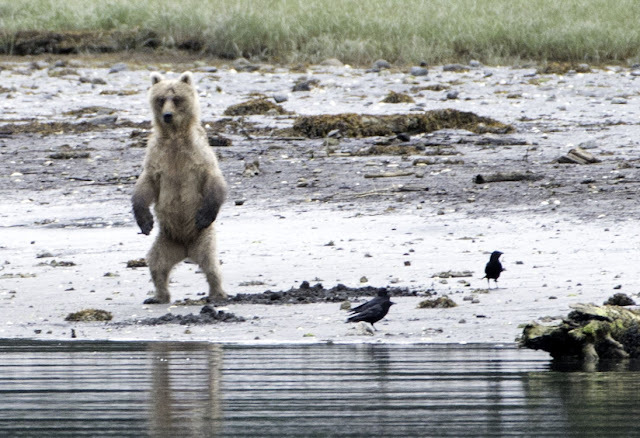 That's Laurie out for a paddle. After we got around Kuiu we stopped in Farragut bay and went to visit Farragut Farm. 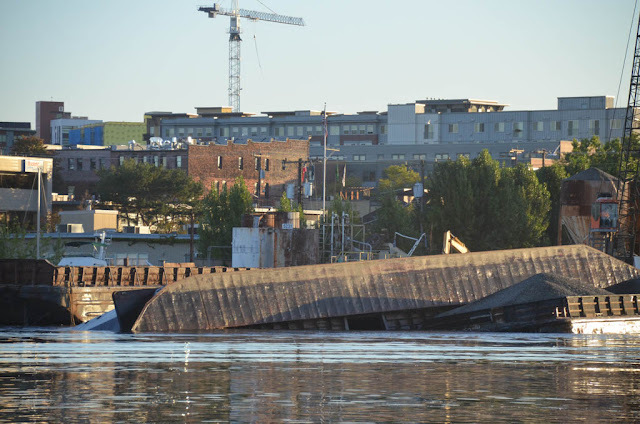 They are completely isolated from everything with the only way in and out via boat, and only at high water. And once ashore, it's still a 1/2 mile walk to get to the farm. But despite this, they run a vibrant business selling at the Petersburg market once a week, and supplying fresh veggies to a variety of businesses and small cruise boats throughout the season. Bo and Marja run the whole operation themselves. 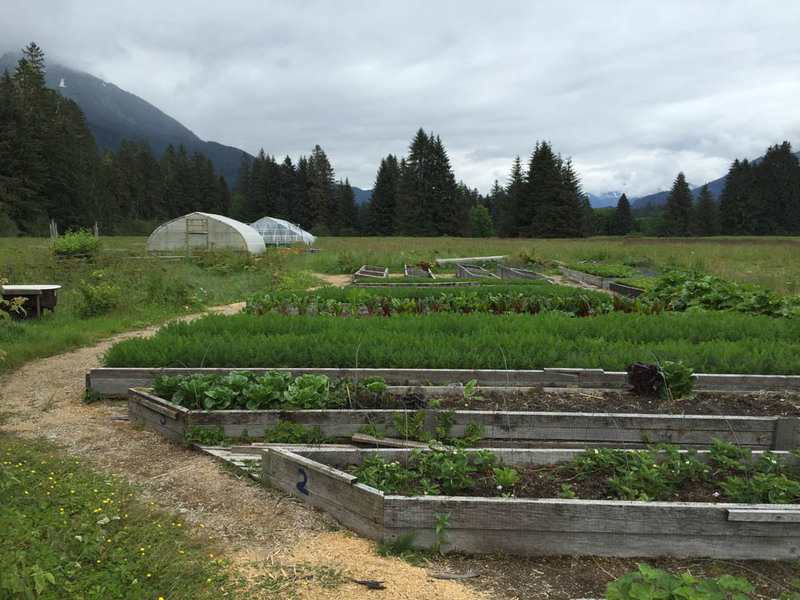 We got a great tour and stocked up on veggies for the rest of our trip. Next stop was Peterburg for the much anticipated Nordhavn Rendezvous. 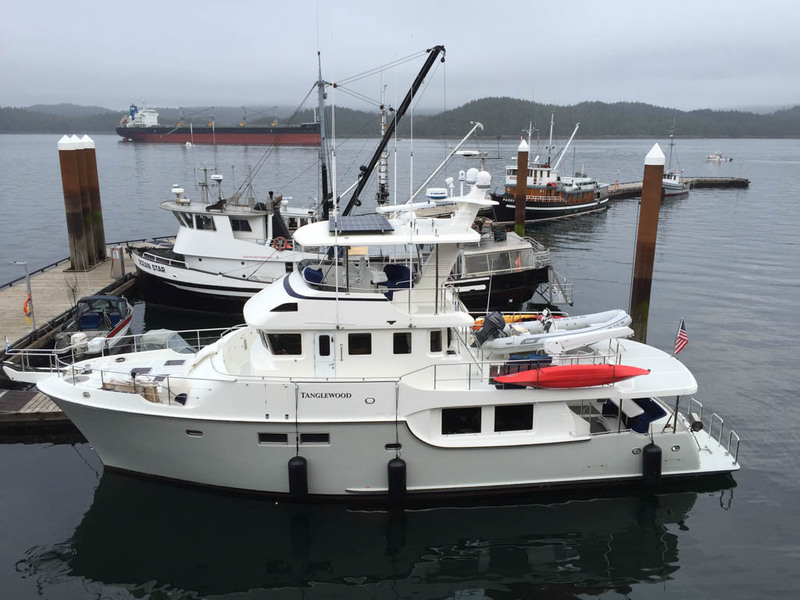 It was organized by a couple of owners, and blossomed unto the largest gathering of Nordhavns ever, with over 30 boats and 100 attendees. A good time was had by all, but we got a real curve ball the day before the event started. Our daughter who lives in Seattle broke her leg, required surgery, and was facing 10 weeks of no driving, no carrying anything, etc.. It's amazing how much we take for granted being able to move around and do things with our hands, and equally amazing how helpless you can be without it. So Laurie flew back to Seattle to help with everything through the surgery, and I started sorting out how to get the boat back to Seattle. 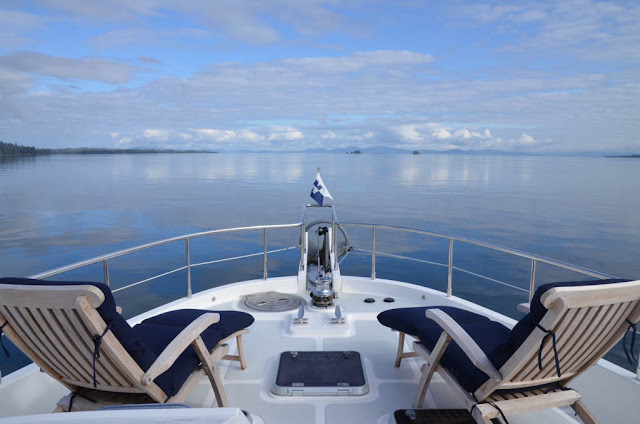 We had originally planned to keep cruising until around the 1st of August, so this cut us short a bit, but not by too much. And besides, you need to take what life throws at you. I'm just glad we were able to change our plans and help out. I was able to pull together family for crew in two shifts. First was brother-in-law Paul who flew up to Petersburg and helped get the boat down to Port McNeill in BC, Canada. 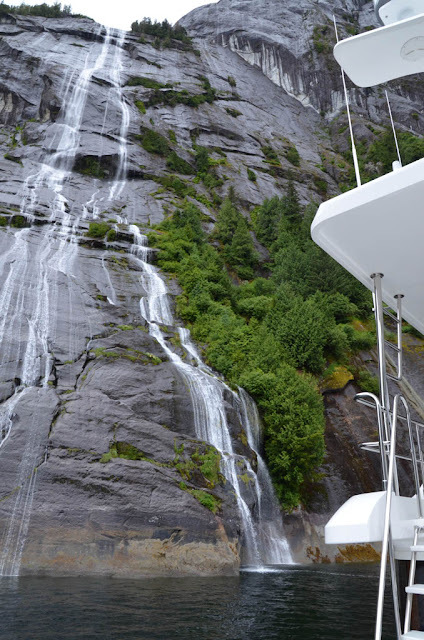 One of our stops was Prince Rupert where we checked into Canada, and also checked out the new Cowe Bay Marina. 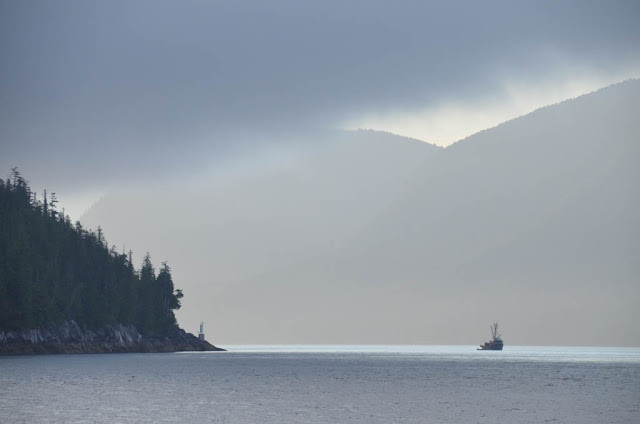 It's good, all things considered, but Prince Rupert is a pretty exposed harbor. 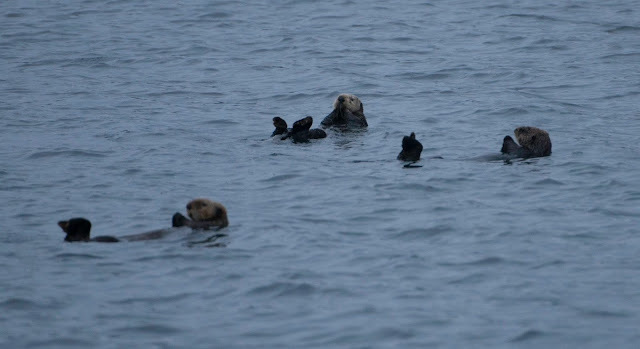 We usually anchor in a cove nearby that offers better protection, but it was nice to tie up and have access to the town. 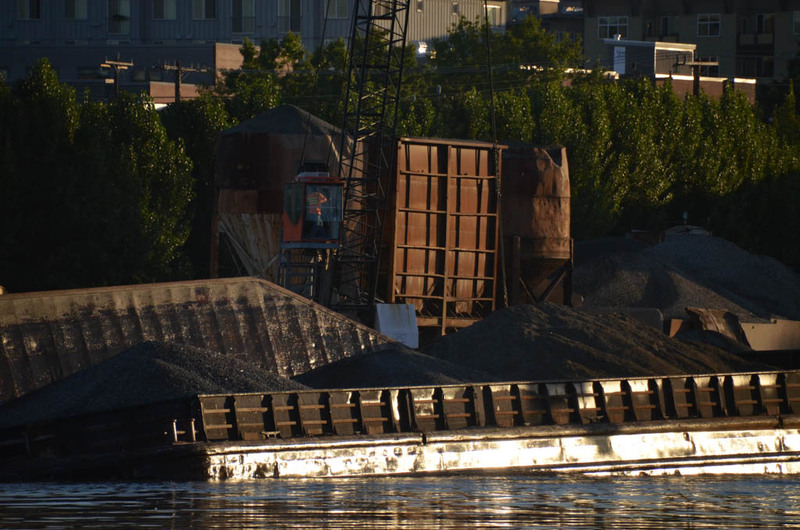 Before this new marina, there were almost no accommodations for transient boats. 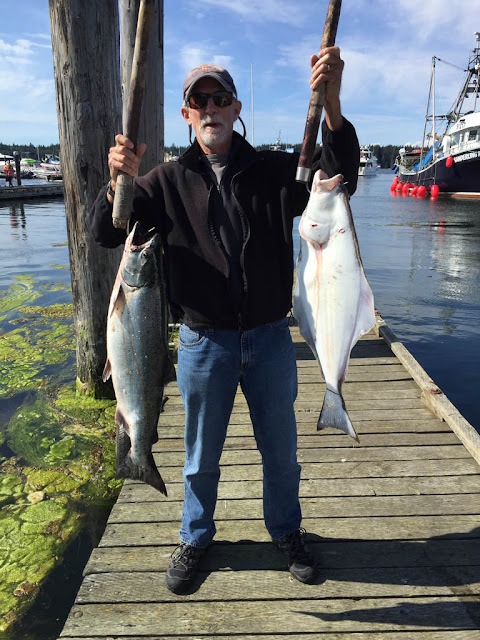 We had a bunch of long days, but made good time and didn't get delayed by weather, so arrived in Port McNeill a day early giving Paul time to go on a fishing expedition. Paul and brother Dave crossed paths at the Vancouver Airport as Paul departed and Dave and significant-other Scottie joined me for the second stretch down to Seattle. 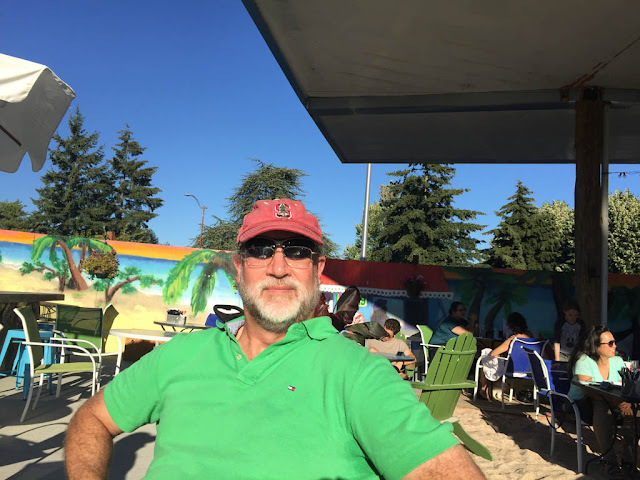 Once again we had no trouble with weather and made excellent time, arriving a day or two early, and affording Dave and Scottie some time to explore Seattle, including an obligatory visit to Bongos for Cuban food. Brother Dave at Bongos. "Where's my food?" Dial forward 10 weeks, and Lindy is back on her feet, driving, rock climbing (indoors), and rapidly regaining all her strength and agility. 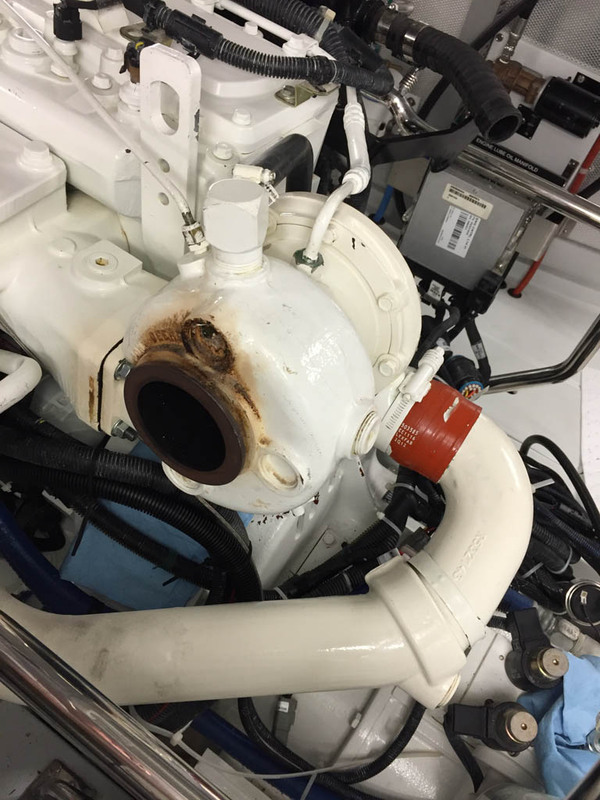 Keeping a boat's engine room cool, relatively speaking, is very important. When things get too hot, all sorts of wear and deterioration starts to accelerate, including wear on you if you need to spend any time in there. Spending any length of time in a 130 degree space is not just uncomfortable, it's down right dangerous. But if something breaks, you gotta go in. Speaking of 130F, that's one of the magic numbers. 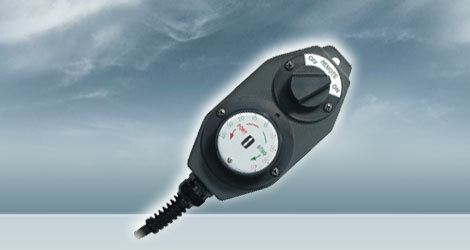 A variety of equipment is specified up to a max ambient temp of 130F. Go above that, and you are on your own. Warranties are void, etc, etc. I say that 130F is one of the magic numbers, because there is another one. 30F delta-t. Delta is a Greek letter, and is used in science to represent the difference between two numbers. So 30F delta-t means a temperature difference of 30 degrees Fahrenheit. And the difference is between the outside air temperature and the temperature in the engine room. 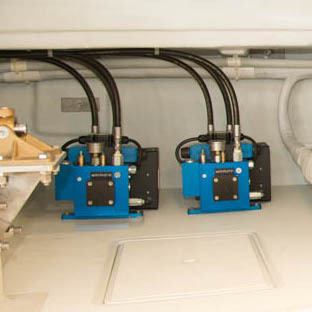 If you want to run your engine room electrical equipment and machinery within the limits allowed by the manufacturers, you need to stay under BOTH numbers. 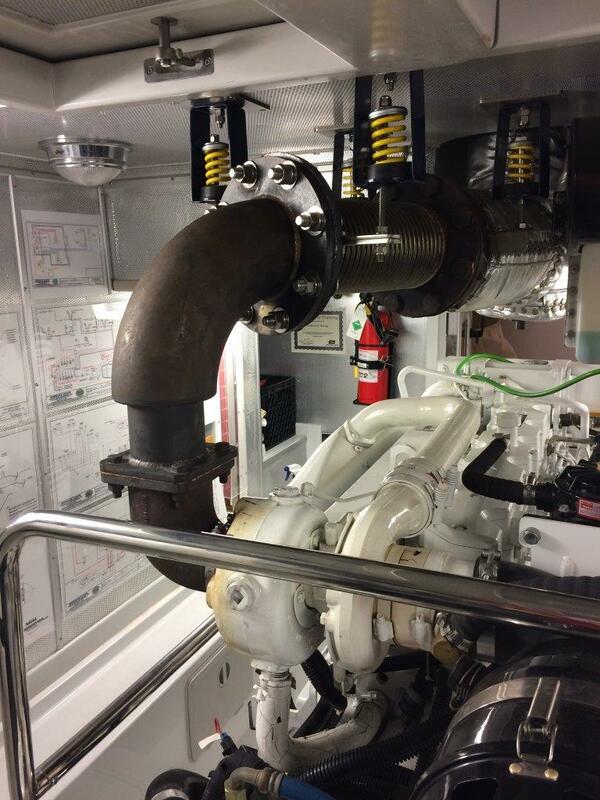 The effectiveness of an engine room's cooling system will determine the delta-t for the boat. Cooler is always better, but this means that a cooling system must keep the ER temp at no more than 30F over the outside temp. 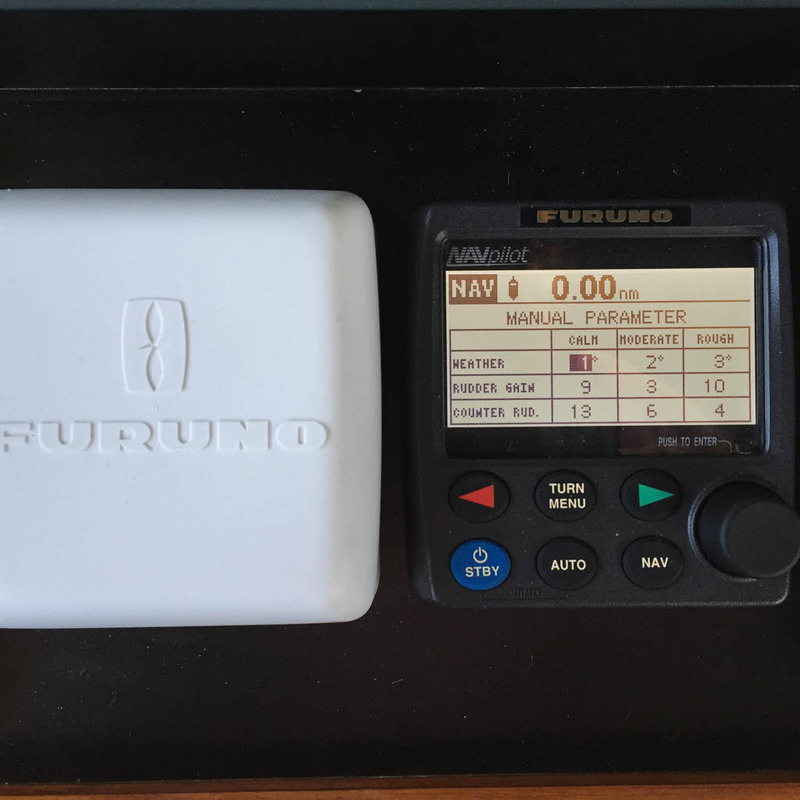 This in turn limits the boat to operation in 100F outside temp, because if it gets hotter than that outside, you will start to exceed the 130F absolute temp limit. If, on the other hand, you can limit delta-t to 20F, your ER runs cooler under all circumstances making it more hospitable to you personally, and it allows for operation in a hotter ambient temp. So the goal is to keep the delta-t as low as practical. 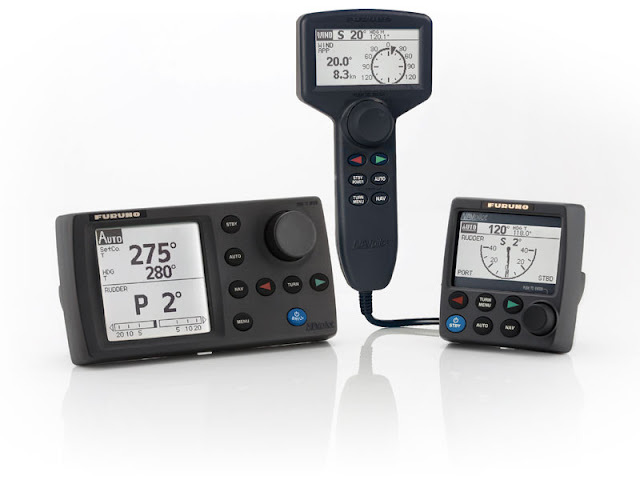 Everything in a boat's design is a trade-off, so these goals are often hard to meet, or in some cases not met at all. 1) What are the sources of heat and how much do they generate. The biggest source of heat in your ER is your engine (or engines). Additionally there may be a generator and some other gadgets, but the main engine will dominate, so that's the thing to focus on. Engines work by burning fuel. Some of that energy is turned into propulsion power. but most of it (about 70%) is waste heat. 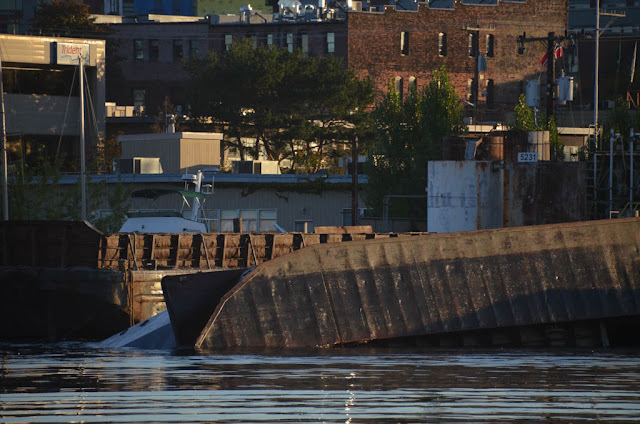 The majority of waste heat is removed via the engine's cooling system and ends up in the surrounding sea water. 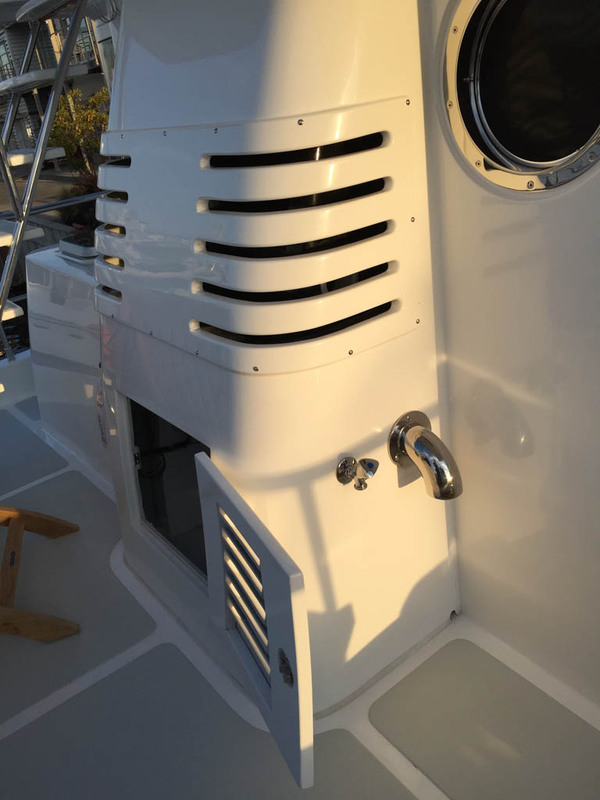 In the case of a keel cooler, it transfers to the sea water that passes by the outside of the boat. 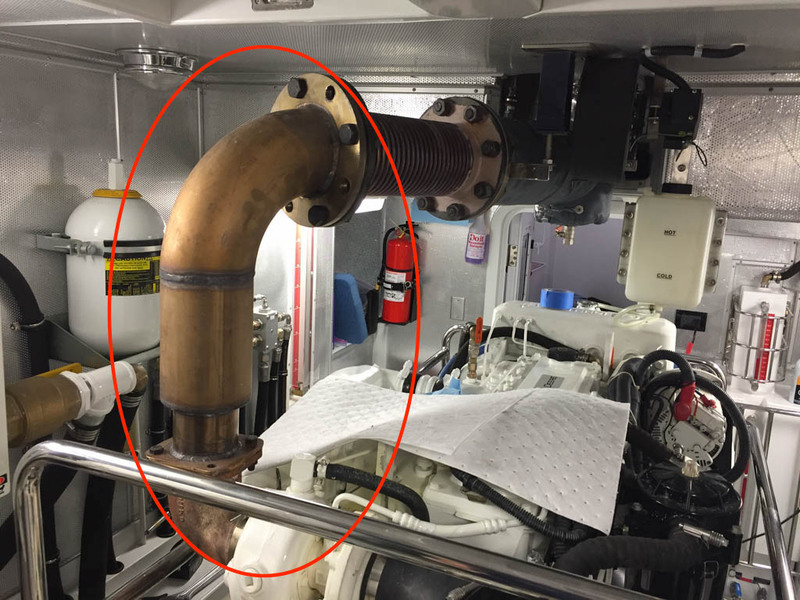 In the case of a wet exhaust, it's transferred to the sea water that is pumped through the heat exchanger and exhaust system. But there is still a significant amount of heat that is dissipated into the surrounding engine room. It's only about one tenth the amount of heat that goes out through the cooling system, but it is still a lot. One way to look at it is that you have a 1000lb to 2000lb radiator sitting in your ER running at 200F. That warms things up. The amount of this "ambient heat rejection" is specified by the manufacturer for every engine so whoever is designing around it can figure out the cooling. 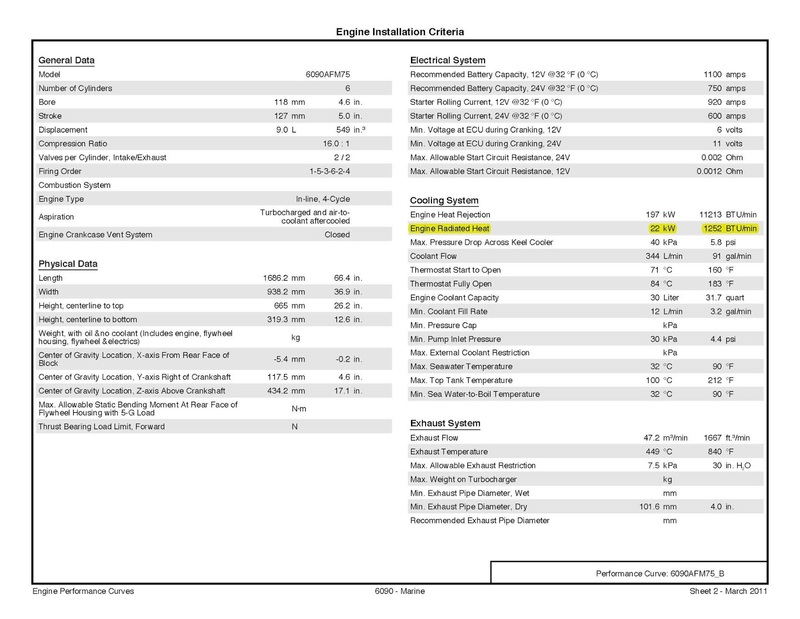 Below is the spec page for my engine, with the heat rejection number highlighted. 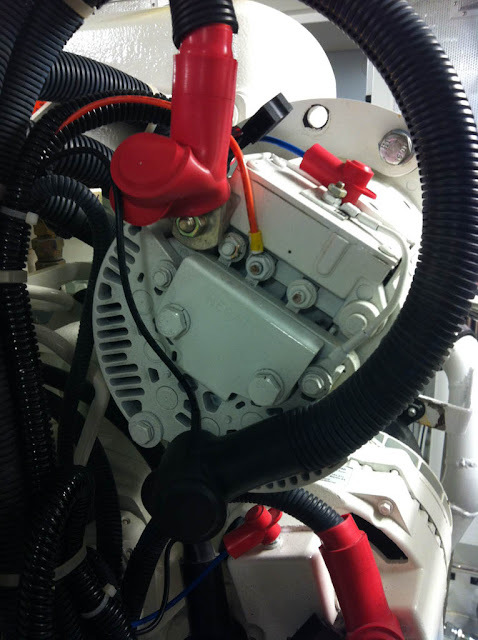 The heat rejection is 22kw. A little electric space heater is about 1kw, so it's like having 22 of them running in your ER. It's a lot of heat to remove. 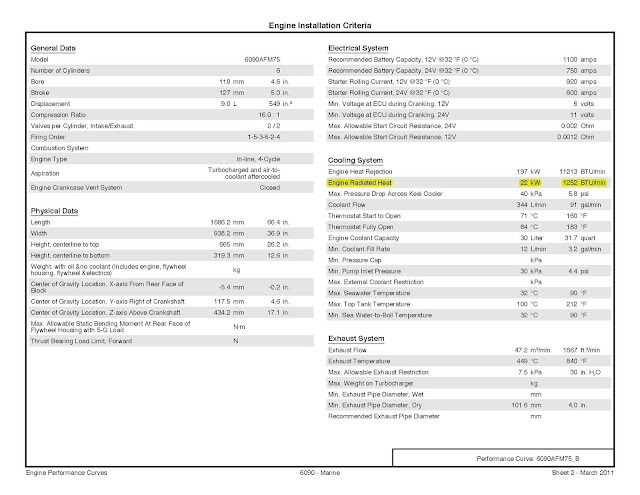 Specs for Deere 6090AFM75 engine. 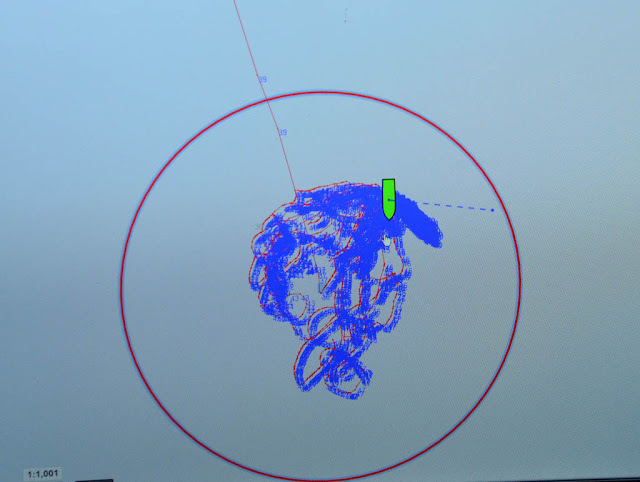 Heat rejection highlighted. Getting that heat out of the ER is usually accomplished by air flow, pulling fresh air in from the outside, passing it through the ER where it heats up, then dumping it back outside. Physics is everywhere, and there is a formula relating heat, air flow, and delta-t.
CFM is cubic feet per minute of air flow. BTU/m is British Thermal Units per minute and is a heat rate. And Delta-t we have talked about. So with this formula you can figure out the air flow required to maintain a certain delta-t, given the heat rejection rate of your engine. 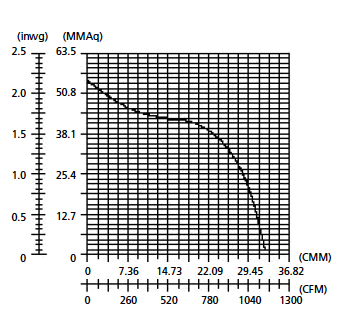 This tells you what the Delta-T will be for your engine's heat rejection rate and some given air flow rate. When you run the numbers on my engine, it says that I need about 3500 CFM of air flow to maintain 20F delta-t. I think 20F is a good number to strive for. Under most circumstance it will keep your ER at 90-110F which is tolerable, and it means you can run in 110F ambient if required. Lower would be wonderful, but as you'll see in the next section, it gets harder and harder to move the requisite amount of air, so you need to find a balance. So I set 20F as my goal. This is where things get challenging. Up to this point it's really easy to calculate how much air flow is needed, and it's really easy to say you want more. But now you have to find a way to actually make it happen and this was the problem on my boat. Are moves easily in open spaces, and is progressively harder to move as space becomes more confined. But this is often overlooked. Take breathing as an example. You can break in and out easily because your wind pipe and mouth are large enough. There is no restriction. Now try breathing through a 1" hose. You will probably be fine, but will surely feel the restriction as you push and pull air through that hose. Make the hose longer, and it gets harder. Now try breathing through a straw. Good luck with that. It's just too small to move the requisite air. This was a major problem on my boat. As originally built, there were two blowers serving the ER. 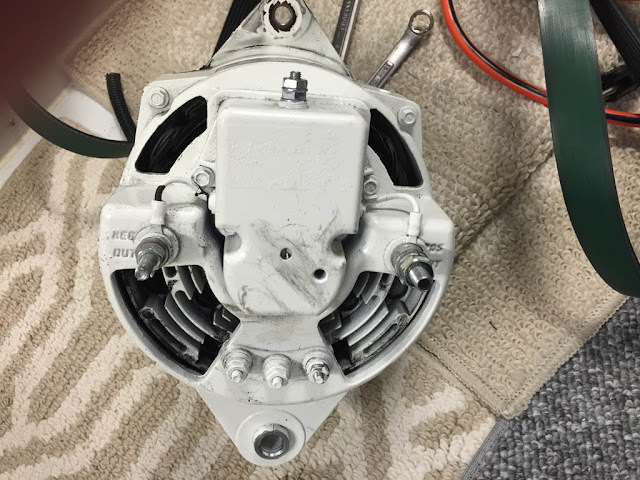 One was rated at 220 CFM and connected to a 3" hose, and the other rated at 1200 CFM and connected to a 5" hose. Each hose was then about 10' long. When you look at the performance specs for a fan, it lists the CFM rate in free air, i.e. with no restrictions. That's like you breathing, and is the best you will ever get out of the fan. Then they list the performance at different levels of back pressure which is the restriction imposed by a duct or hose. This is like breathing through various size hoses. Once again, physics is everywhere, and there are formulas for calculating the back pressure when trying to move various quantities of air through various size hoses and ducts. There are simple back pressure calculators on line, and I made use of this one. When you run the numbers, the back pressure trying to move 1200 CFM through 10 of 5" duct hose is 2.5" of H2O. Now take a look at the performance specs for that 1200 CFM fan. In the chart below, you can see that with 2.5" H2O of back pressure, the fan is completely stalled and not moving any air at all. That's not good. Now in practice, as the duct resistance increases, air flow decreases, and eventually the war between the duct resistance and the fan finds a point of equilibrium along the line in the chart. As part of this project I bought an inexpensive airflow meter to help see exactly what was going on, so I measured the air flow through the 1200 CFM fan. It was 370 CFM. This is the big fan in the ER cooling system, and it's only moving one tenth of the required air. The situation for the other fan was similar, with actual air flow of 70 CFM vs the free air spec of 220. The obvious conclusion is that both fans are contributing very little to cooling the ER, and might even be a net negative given their power consumption. 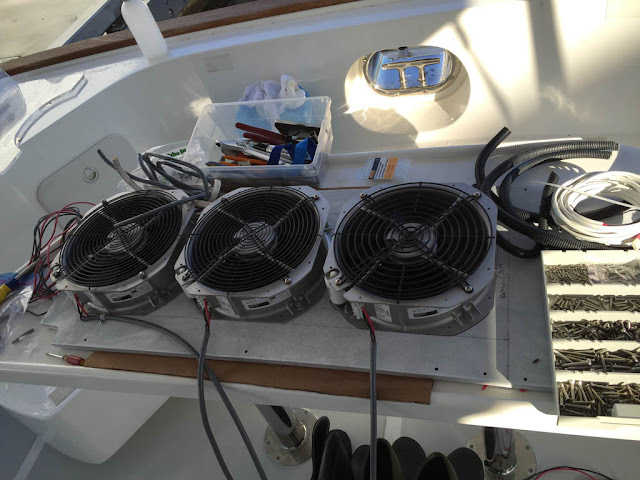 Between the two fans they represent about a 1kw electric load while underway. That power is generated by the engine alternators which dissipate more heat the more they are loaded. The moral of the story here is don't try to breath through a straw. 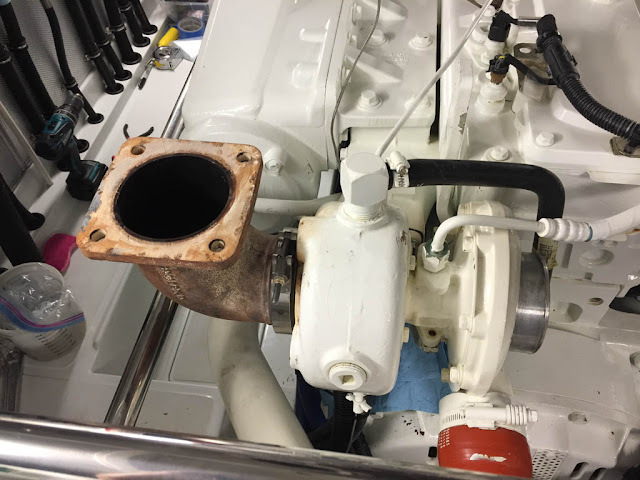 As originally build, my boat had another fan about half way up the exhaust stack, and that's another example of what not to do. Air, water, electricity, and probably lots of other things follow all possible paths, and do so in proportion to the resistance of each path. 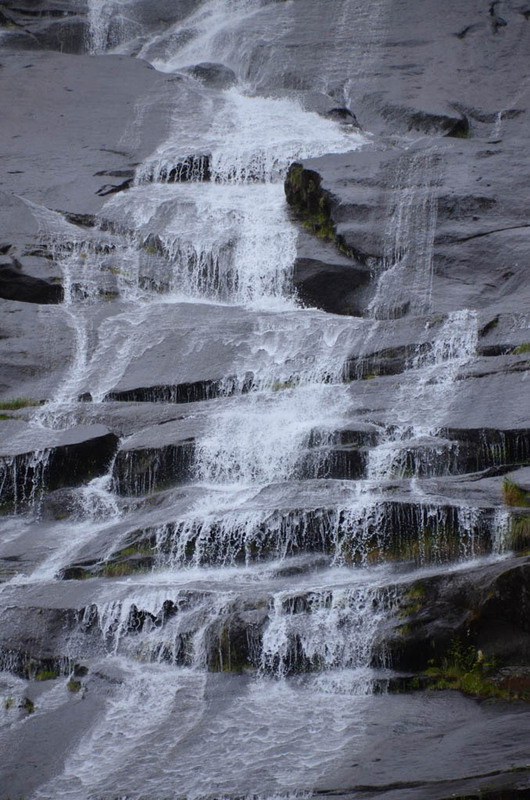 A waterfall will have a main channel, and tributary paths, each sized according to how much water can squeeze through each path. Air does the same thing. This upper stack fan had a hose that hung down inside the stack cavity about 3 feet, then it blew out into a vented compartment on the boat deck. I think the idea was to pull air up the stack and push it out through the compartment. But in actuality it pulled air from down the stack, from up the stack, and from any direction it would flow. 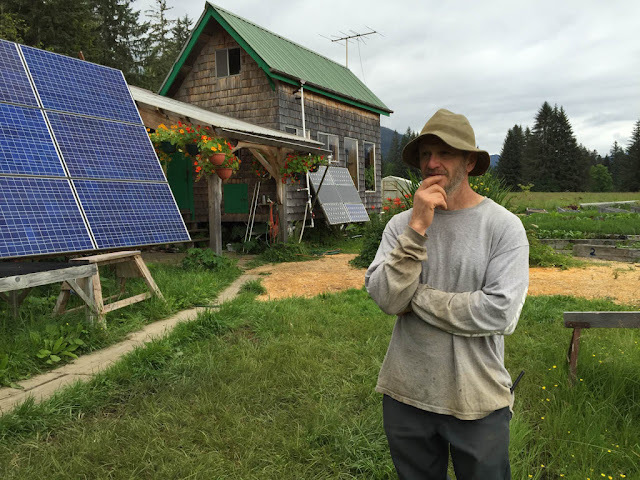 The net result is that is too did pretty much nothing but consume electricity. What does effectively move a lot of air through the ER is the same thing that generates all the heat - the engine. It's actually a pretty large and very effective fan, pulling air from inside the ER, and expelling it out the exhaust. Going back to the engine specs, it tells us that my engine moves 730 CFM of air. So far, that's the biggest air mover on the boat. Adding it all up, we have 730 from the engine, 370 from the big fan, and 70 from the little fan. That's 1170 CFM total. With that amount of air movement, the predicted delta-t is 52 degrees. That's obviously not acceptable. They cooling system as originally built had no chance of succeeding. Stepping back, the problem is the size of the air passages. We haven't talked about the intake side and that's just as important. 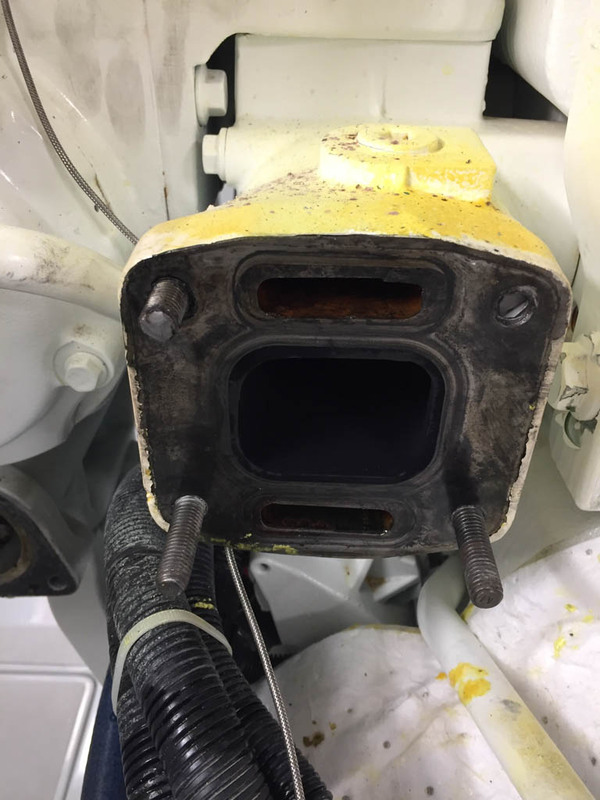 On my boat there are two intake vents, one on each side of the cockpit. These lead down through a large tunnel and emerge through apertures in the ER. Running the back pressure calculator on those passages suggest that they are large enough to carry the desired 3000 or so CFM without creating undue resistance. So the intake side looks good. The outflow side of the equation, however, is a big problem for those two meager houses. After a while the light bulb finally lit, and it became evident that the exhaust stack was a good size cavity leading straight from the ER to the outside. It's much, much bigger than the hoses. Running the calculations using it as an air duct shows it can move 3000 CFM without excessive back pressure. Perfect. If a way could be devised to pull air up the stack shaft, there would be enough space to actually move the required amount of air. With this approach, the airflow path would be in the cockpit vents, into the back corners of the ER, forward through the ER, then up the stack right over the main engine. The best place for fans was in the upper stack at the boat deck level. Looking at the picture below, this structure is all open inside with storage space below by the door, and open space with vents above. Then there is a removable panel that runs the full height separating the cabinet from the stack. So the wall with the port light in it separates the cabinet from the stack, with the removable panel inside the cabinet. 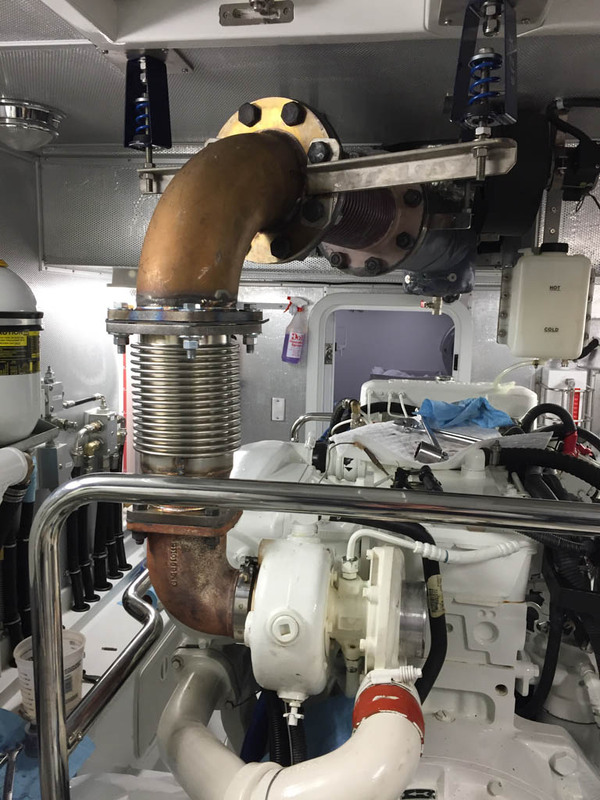 The first attempt at this was done in Dana Point when we were commissioning the boat and struggling with high engine room temps. 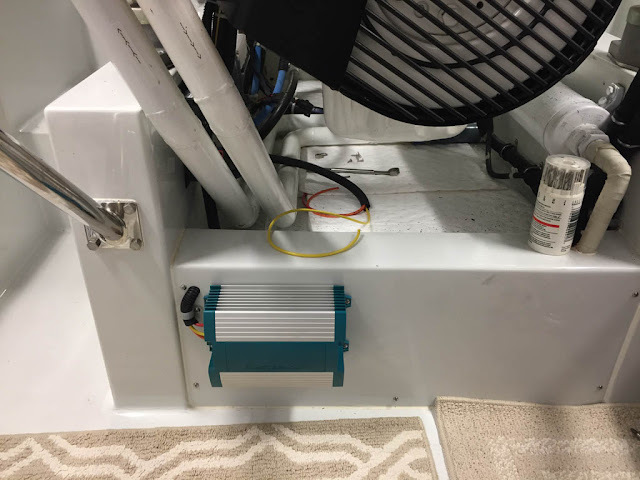 The idea was to eliminate the silly fan with snorkel hose (it previously lived in this cabinet), and install another 1200 CFM fan in the divider panel. 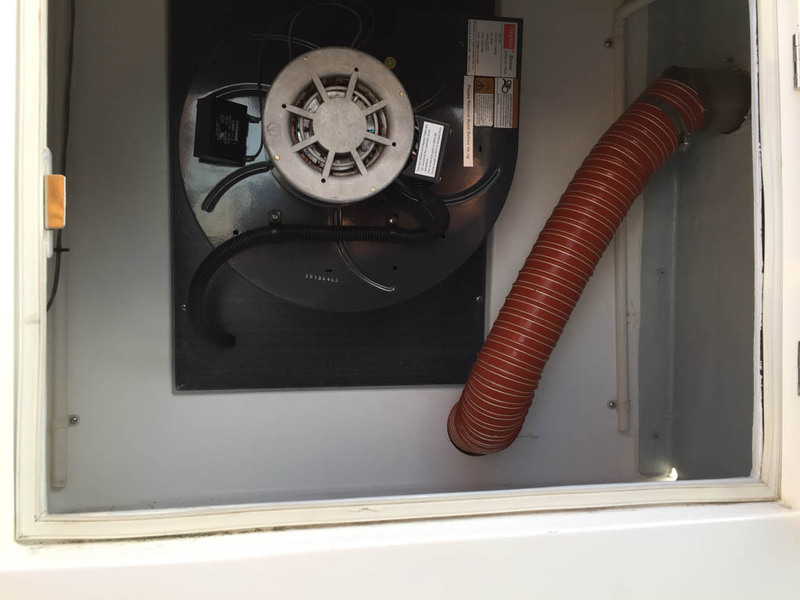 The fan would pull air from the stack and exhaust it in the cabinet where it could flow out the vents. Below is the fan mounted on the divider panel, and below that you can see the panel's full height looking up inside the cabinet. Remember this for later on... Oh, and ignore that red hose. It's the exhaust for the shroud blower that cools the exhaust pipe jacket. The idea was good, and seemed to get ER temps down to the magic 30F delta-t. But that didn't last, and later I would find that on long runs the temps would still climb over 30F. This biggest issue with this first step is that it was only a first step, and still suffered the same flaw as the snorkel hose fan. Air follows all available paths, and this was pulling just as much cool air down the stack as it was pulling hot air up the stack. 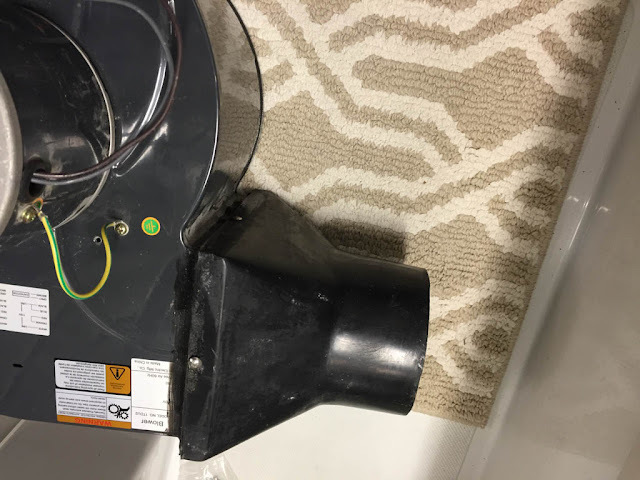 What was still needed was some sort of baffle in the stack to seal off the area above the fan and force all air to be pulled up from the ER. 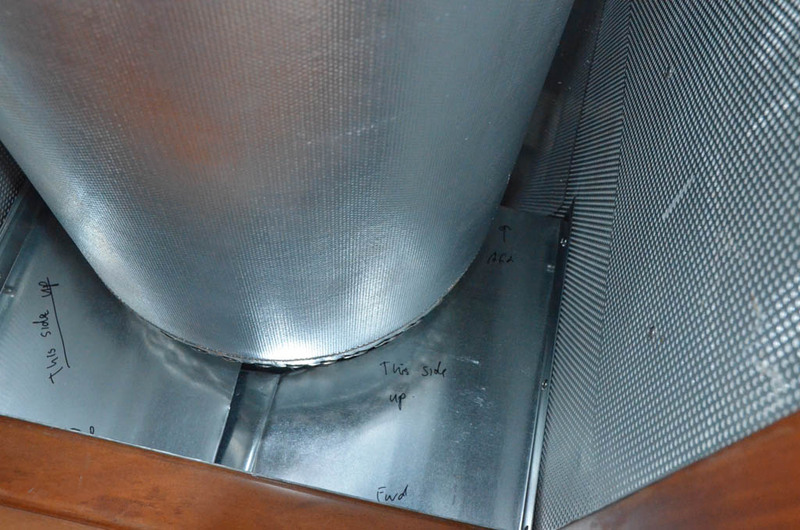 In the spring of 2015 I fabricated a simple baffle made out of galvanized duct material. Although not a perfect seal, it had the desired effect of forcing the air flow to come up the stack. For the first time, air flow measurements in the stack were right about 1200CFM, exactly what the specs for the fan stated. We ran for the summer of of 2015 like this, and although it was a big improvement, we were still hovering around 30-35F delta-t. Running the calculations with the full 1200CFM of air flow, plus the engine air flow, it predicted 33F delta-t - just what we were seeing. The problem remained a need for more air. Something between 2000 and 2500 CFM in fans, with the rest from the engine would get it to the desired 20F delta-t.
One experiment I tried over the summer was shutting down the two engine room fans. Together they were consuming about 1kw of power, and only moving a small amount of air. I was curious what would happen if I just shut them off, so I tried. The answer...nothing. Turning them off had no impact at all on ER temps, so I left them off permanently, and when we returned to Seattle, I removed them completely and just connected the ducts through to the ER with no fans. Now they serve as supplemental passive air intakes. 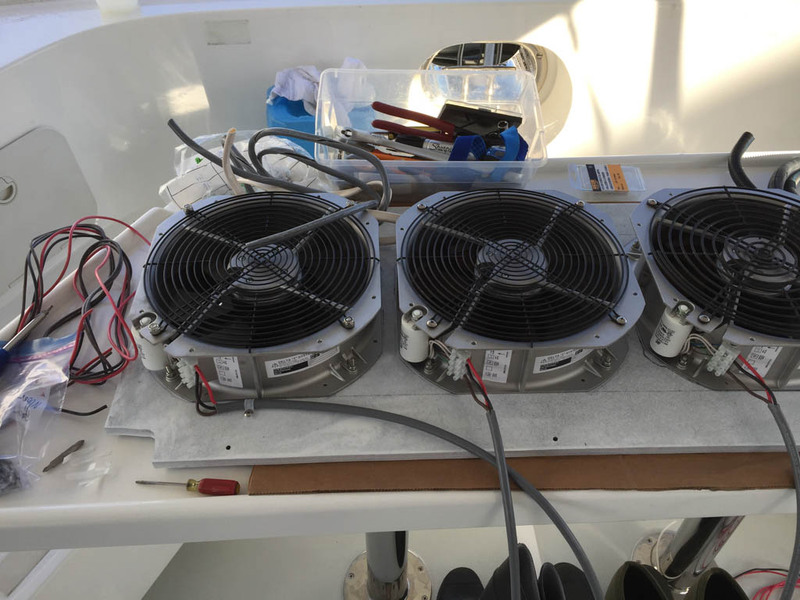 In the fall of 2015 I visited Delta-T Systems, manufacturers of fans and systems for boats, and sat down with one of their applications engineers to review my plans and calculations, and see if we could pick some fans for the job. Long story short, he agreed with the calculations, and I selected their Small AC Axial Fans. 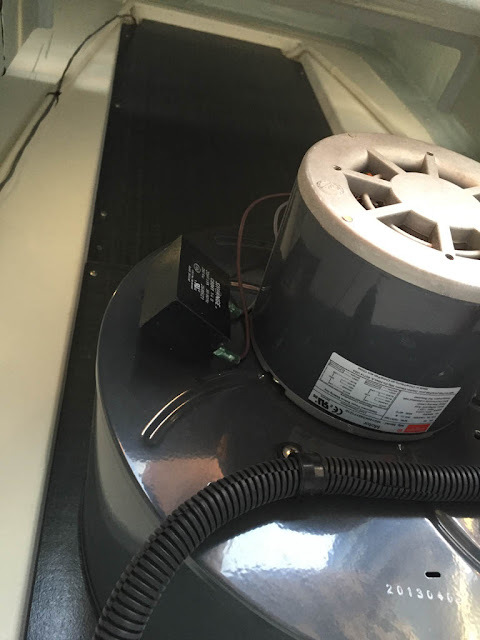 AC power meant no rewiring since AC fan power was already present in the cabinet. 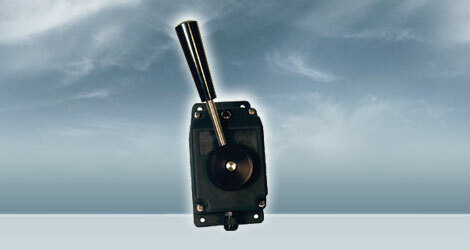 The 11" model is quiet, consumes only 185W of power, and can move about 1000 CFM. I bench tested one at home, and the thing took off across the bench from the air blast. Their size allowed be to fit three of them in a vertical row in the cabinet divider panel, and still have space below in the cabinet. One down side of the first fan installation is that it consumed the entire cabinet. I had to fabricate a new divider panel and mount everything up, but was able to do it out on the bench. Below are the three fans ready for final wiring and then installation as an assembly. 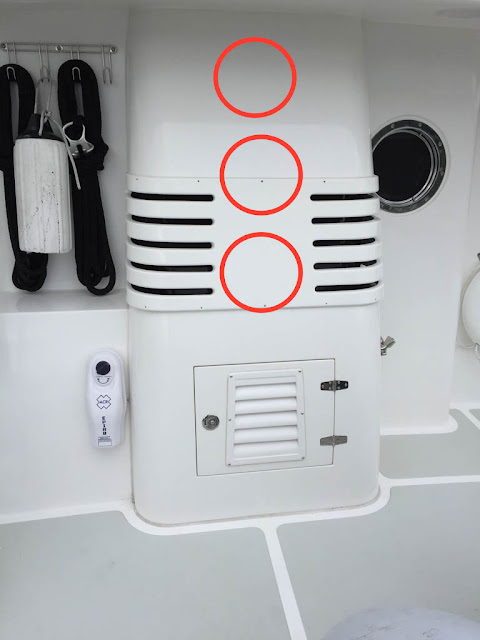 The picture below shows the approximate locations of the stacked fans once installed in the boat deck cabinet. In conjunction with installing the new fans, I need to relocate the baffle. 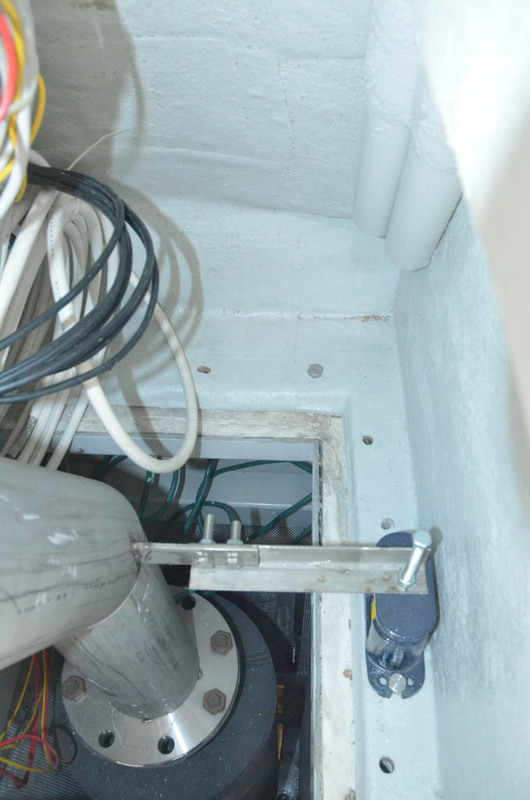 The original baffle was just above the original fan location, and the new triple decker fans were located up towards the top of the cabinet. 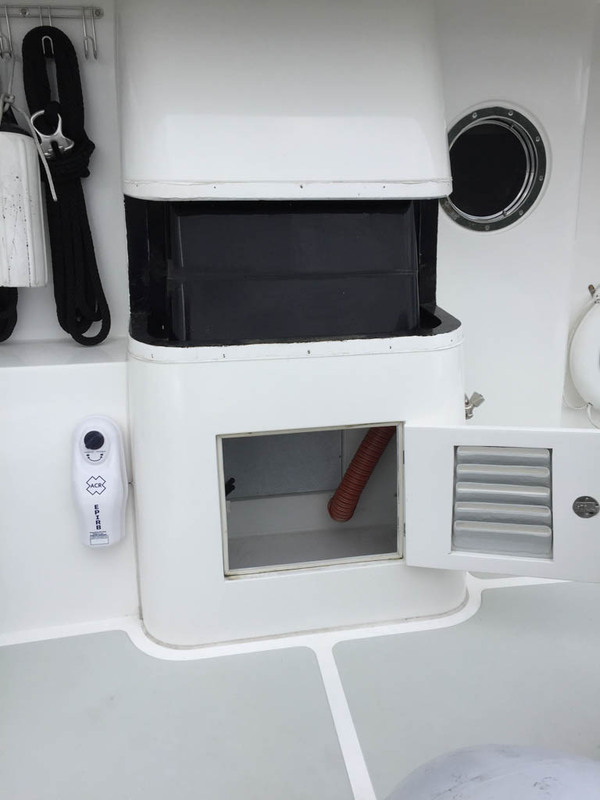 So I built a new baffle which is nothing more than two pieced of fiber board that fit into this square recess where the stack transitions from the boat deck to the flybridge. This picture shows the location, but not the baffle itself. In January of 2016 I finished installing the fans, and even wired up thermostats in the ER to switch the fins on incrementally as the ER temp climbed. But when I fired them, I was in for a great disappointment. Instead of measuring 2500 or more CFM as expected, I measured 1300 CFM. I was crushed and perplexed but had a bunch of other projects that needed attention, so I left it all for later investigation. After all, it was moving more air than the previous system, and consuming a LOT less power, so it was still a step forward, Just not as far as I had hoped. Over this past summer (2016) we observed a pretty consistent 30F delta-T on long runs. My suspicion was that the cabinet was imposing too much back pressure on the fans, and not allowing them to move their rated air flow. The cabinet has a few baffles to prevent water entry, and the vent slits are potentially restrictive, so very late this summer I started to experiment on a couple of long runs where there was plenty of time for the ER to heat up. First I removed the upper grill, and much to my pleasure saw a distinct drop in ER temp - about 5F over a couple of hours. Then I opened the cabinet door, and the temp dropped again down to a delta-t of 18F. Wow, all I needed to do was open that silly door. 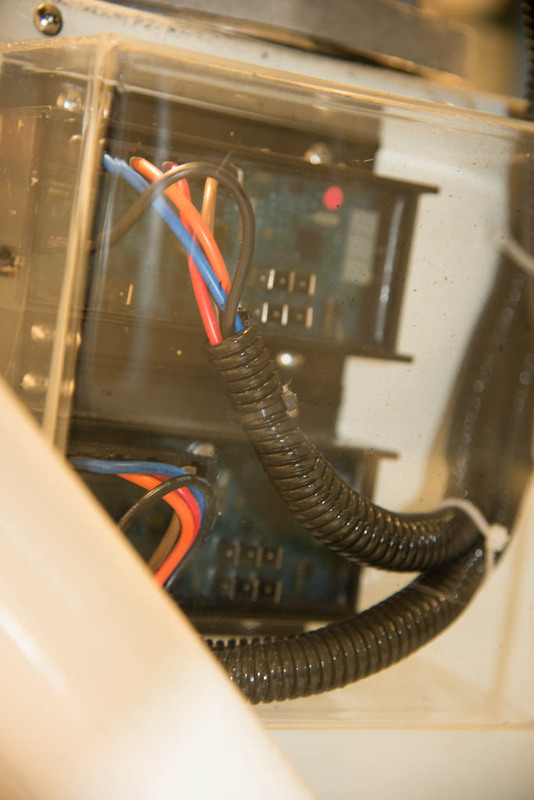 A bunch of subsequent experimenting, including taking air flow measurements in the stack, showed that opening the door had the biggest impact, followed by opening up the upper part of the cabinet. With everything opened up, I can get almost 2000 CFM of air flow which is much closer to the 2500 or so that I expected. And the upper most fan is only 4-6" away from the cabinet with no relief from opening the vent grill or door, so probably explains the missing air flow. But now I know the system works, I know it can achieve 20F delta-T, and I know what final modifications I need to make. I have two 12" square stainless grills on order, and plan to install one in the door, and one up towards the top of the blank space directly in front of the uppermost fan. I also ordered a 4x18" grill to install immediately above the door, but will probably wait to see how things work with the other two before I cut that one in. There are always lots of ways to skin a cat, and ER cooling is no exception. Many people have upgraded various fans, but kept the basic cooling arrangement. This helps a bit, but if you go back to the fundamental problem which in adequate ducting, it will never really solve the problem. Where a number of people have found some level of success by installing large fans over the intake vents in the ER. I believe this works because it achieves the same air flow as what I've done, just in a different way. By pressurizing the intakes, you force air into the ER, and it needs to exit somewhere. The lowest resistance path is through the stack, so that's where most of the air will flow. The big difference is that you are pushing the air into the ER and out though the stack, rather than pulling it up the stack. 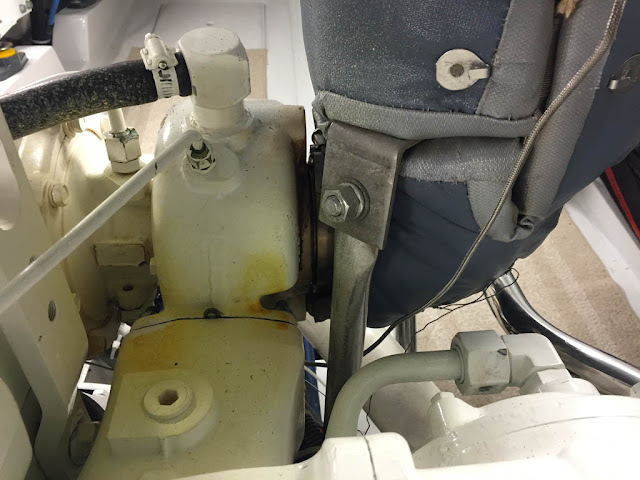 Both work, but the unfortunate side effect of pressurizing the ER is that you also push some amount of air into and through the boat. That both heats the boat, which sometimes can be good, but it has the undesirable effect of also pushing ER odors into the boat as well. 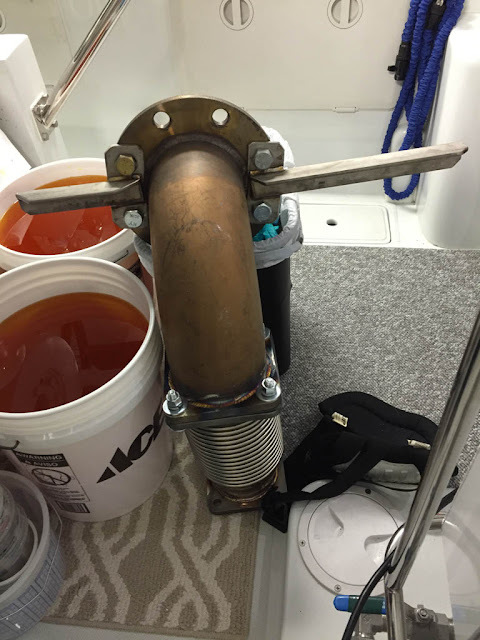 By sucking air up the stack, the ER runs at a slight vacuum and any fumes or smells get pulled out of the boat.